Rhodes College received a A.
Washington Monthly's ranking of 154 out of 224 of Affordable Elite Colleges - Overall Rank was a major contributor to this grade. Tiny Rhodes College in Memphis offers its students the best of many worlds: a highly touted academic program, a beautiful campus, and accessibility to a major metropolis. Rhodes also boasts a highly committed faculty and a killer reputation with graduate schools: the school claims its students' acceptance rate in such programs is over 90 percent. What is a typical Rhodes College student like? Describe the type of person that should attend Rhodes College. One who is an independent thinker who likes smaller classroom sizes. A person who is serious about his future. What are the top 3 reasons someone should attend Rhodes College? What was a typical Rhodes College student like in high school? Describe the type of person that should attend Rhodes College. The typical Rhodes College student likes to study a lot in high school. They also like to play sports. The school's honor code mean exams are not proctored and backpacks are left unattended in the cafeteria. Academics at Rhodes are definitely challenging, yet students agree that the course load is manageable. Students from farther-flung points of origin will enjoy a leg up. Likewise, the school seems to favor athletes. 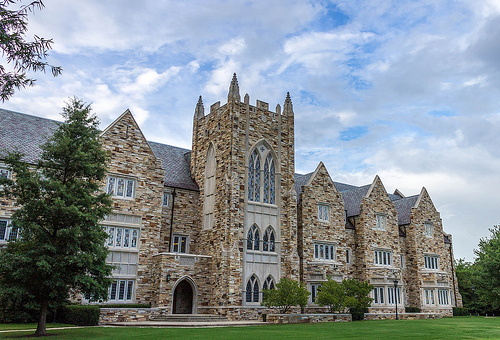 Founded in 1848, Rhodes College provides an outstanding liberal-arts education. The Rhodes experience combines the best of the classroom and the real world--through internships, service, research and other opportunities in Memphis and far beyond. Students learn, play and serve others with a determination to grow personally and to improve the quality of life within their communities. The collegiate-gothic campus sits on a 100-acre, wooded site in the heart of historic Memphis. In this beautiful, supportive environment, our students and faculty comprise a community unmatched in its dedication to learning and a life of honor both on and off campus. In fact, for more than a century, Rhodes has placed its Honor System at the forefront of student life. What are the top 3 things that students do for fun at Rhodes College? 37% of male students live in fraternities. 78% of students graduated in the top quarter of their class. 49% of students graduated in the top tenth of their class. The average student pays $27,755 for tuition, fees, and other expenses, after grants and scholarships. Total stated tuition is $39,484, in-state and on-campus, before financial aid. Learn more about financial aid at http://www.rhodes.edu/finaid/. Estimate the net price for you at http://npc.collegeboard.org/student/app/rhodes. The typical (median) early career salary of Rhodes College graduates is $42,800, according to Payscale. Rhodes College participates in the NCAA Division III for college athletics. Want more info about Rhodes College? Get free advice from education experts and Noodle community members. What is Rhodes greek life like? What percentage of students participate in Rhodes greek life?